Full Day Super Cool Program is relaxing and chill out trip. 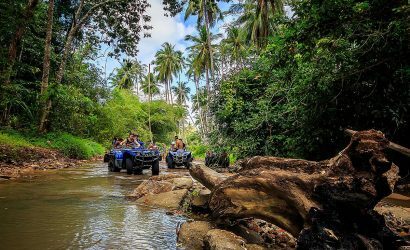 Going on 4 x 4 pick-up truck and take you to see many attraction places in Koh Samui. Also will visit some famous places in the mountain area. This trip has no animals activities or any animal show. Full Day Super Cool Program will visit Grand Mountain Sea View Pool, Teepangkorn Temple on the mountain with panorama view. 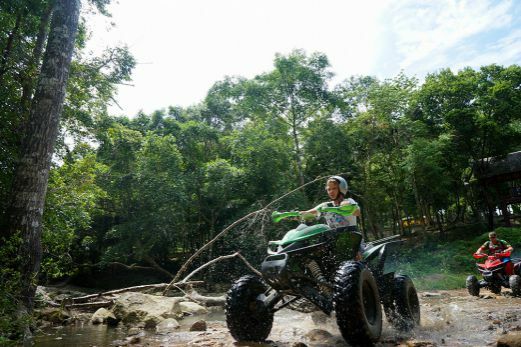 Then visit the Red Temple (Sila Ngu Temple), Guan Yu Shrine, and also visit popular attraction places of Koh Samui such as the Grandfather & Grandmother Rock, Namuang Waterfall number 2 Ending program with ATV riding for 20 minutes and have a buffet lunch. Lipa noi, Pangka 8:35 a.m. / Ban Tai 8:10 a.m. / Nathon 8:15 a.m. / Maenam 8:15 a.m. / Bangrak-Choengmon-Plailaem 8:25 a.m. Chaweng 8:45 a.m. Chaweng Noi 8:50 a.m. Lamai Huathanon 9:00 a.m.
Little trekking to Namuang Waterfall No.2 and swim there. Take you up to the mountain area enjoy the view and stop at Grand Mountain Sea View restaurant where you also can swim or order some drinks (Pay extra by self) and enjoy the view there. You will arrive at the hotel about 17:00 Hrs.